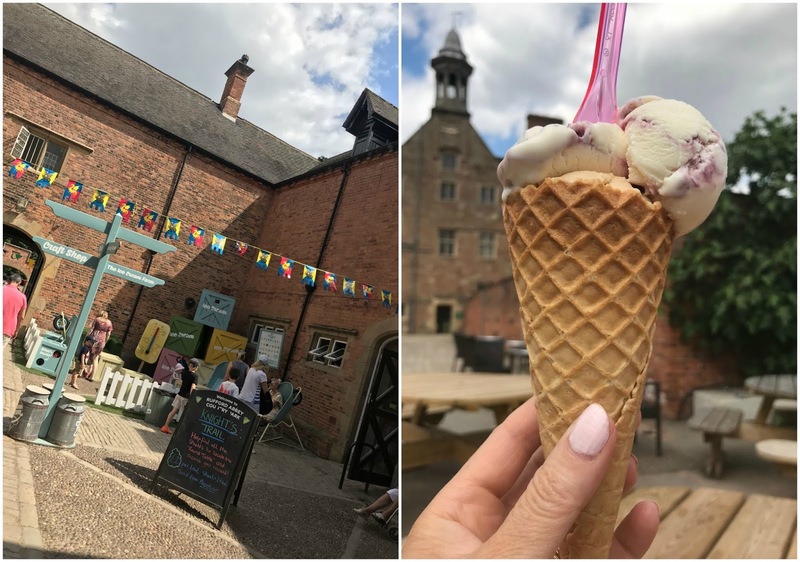 This weekend Nick and I took advantage of the soaring temperatures and headed to Rufford Abbey & country park in Nottingham. We've never been before so it was exciting to go explore somewhere new. It's about a 45/50 minute drive from where we live. 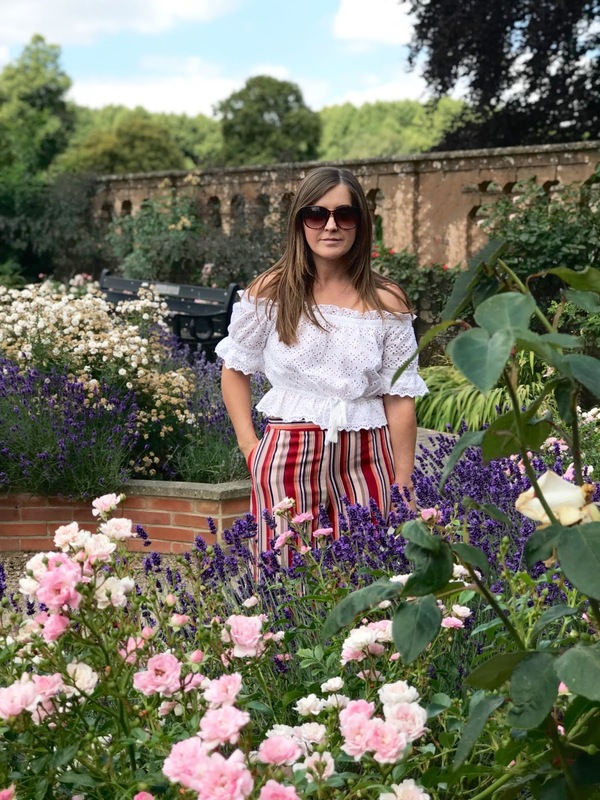 I've been wandering around the house with barely anything on the last couple of weeks but you can't do that when you go out in public really can you, so I wore some super lightweight striped culottes and a little broderie anglaise bardot top, predictable I know, but I like my shoulders and you gotta emphasise your best bits haven't you? 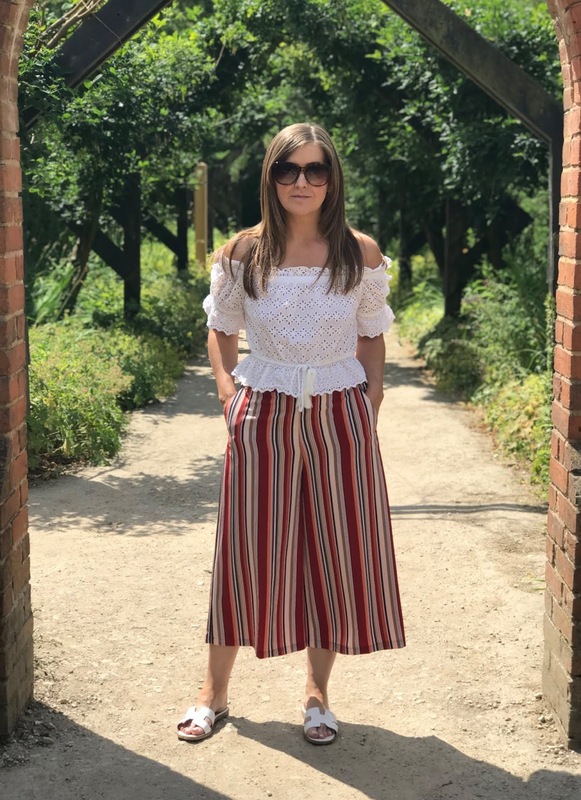 The top and the culottes are both from Primark and I love them. Sorry, I can't link them as they're not on the website but they're still in store. I'll link some similar below too. The shoes are the ones I linked in this post here. 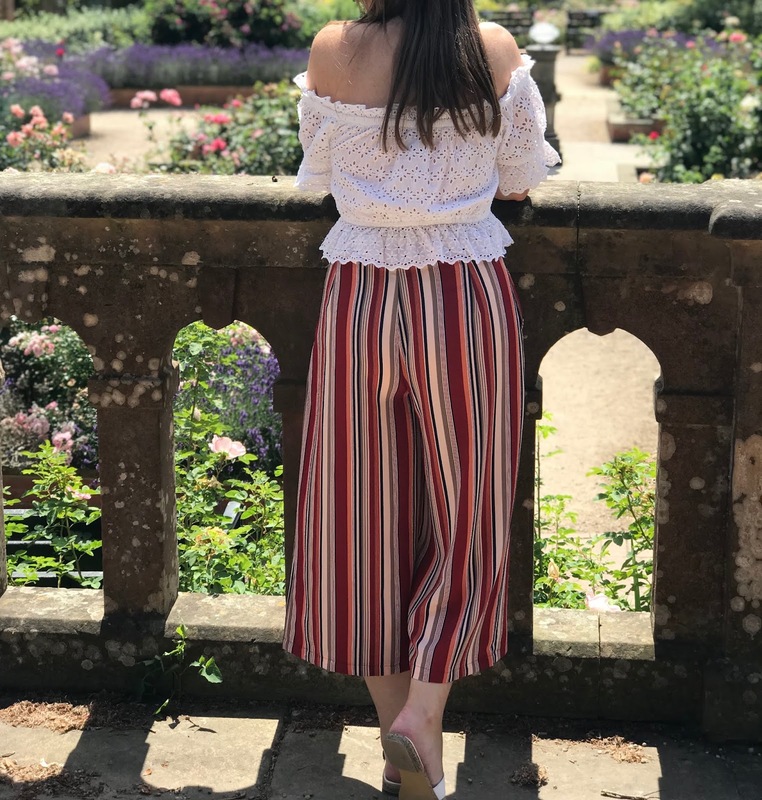 I wasn't too sure on the culottes when I first tried them on, being short I thought they might drown me but they're okay. I will tell you though that I had to get my mum to take them up for me slightly. They were bit too long for my short frame. I think they're just perfect now. 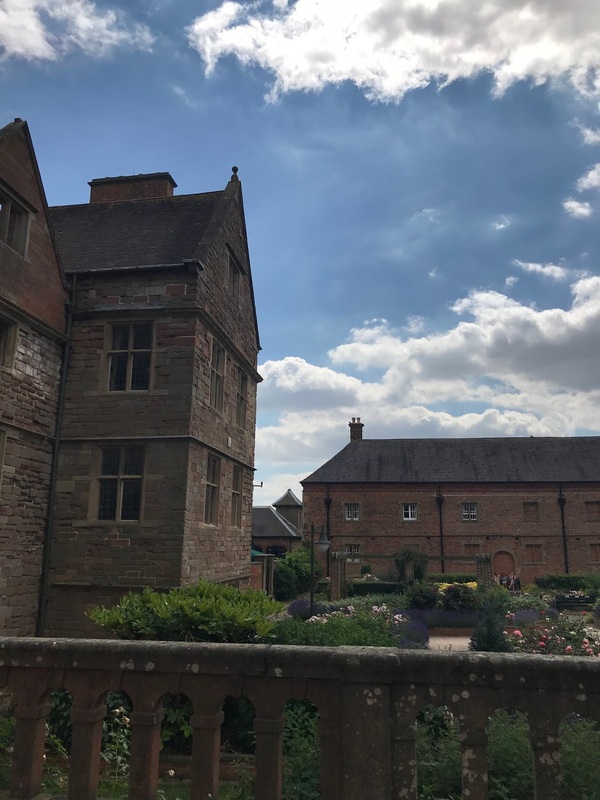 I wasn't sure what to expect of Rufford Abbey, Nick had suggested going because he'd played golf at the Rufford Park golf course in the week and thought it looked nice. 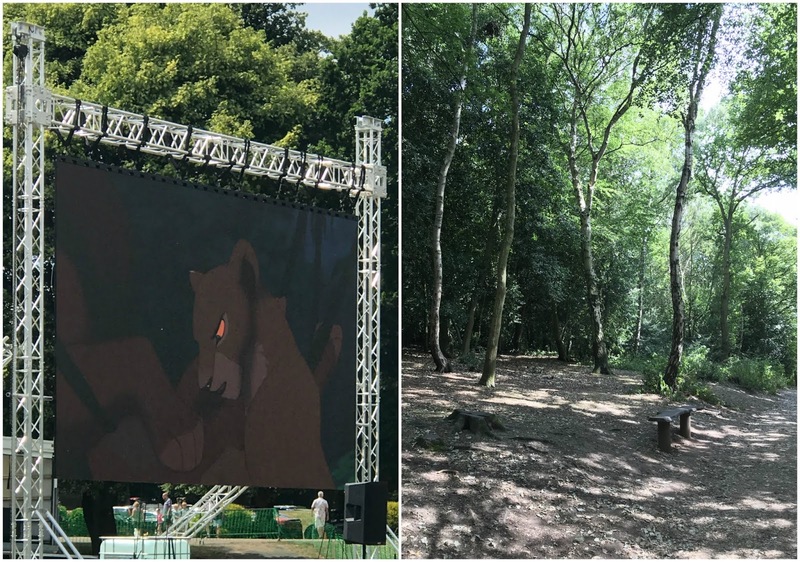 It was very busy but there's plenty of parking, turns out they had an outdoor cinema that weekend and were screening Lion King, one of my faves from when the kids were little, they screened The Greatest Showman the evening before! Still haven't seen that film. Am I the only one? Parking is £3.50 but go for the whole day and make the most of it. I was pleasantly surprised indeed. I was walking around saying "Oh, this is so lovely" every five minutes. 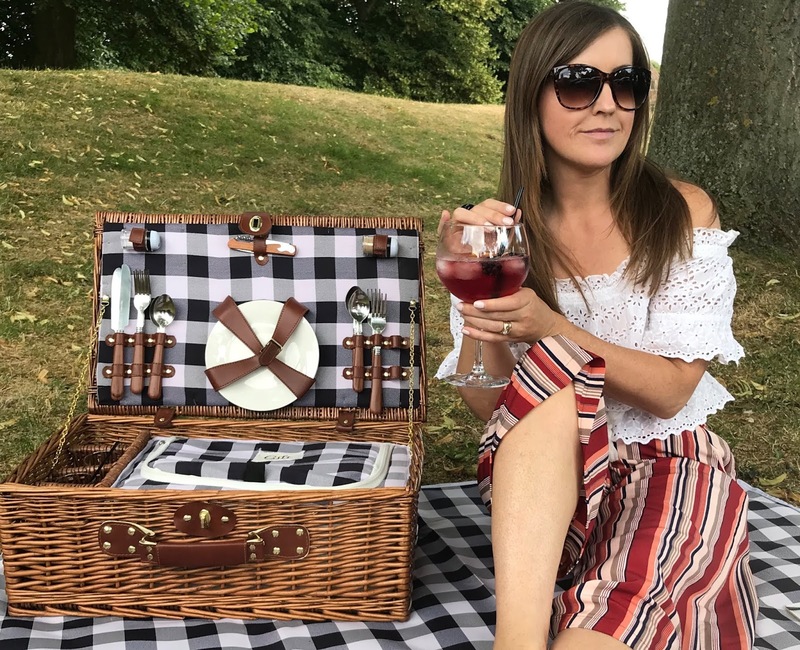 You can go along to just chill, take a picnic and watch the world go by, or get the family together and have a fun day out. I couldn't quite believe how much there is to do. There's the Abbey ruins to explore, the pretty flower gardens, mini adventure golf, archery and a boating lake! They have little shops, restaurants, and an ice cream parlour selling THE most delicious ice cream. I had raspberry ripple and salted caramel and Nick had Ferrero Rocher and salted caramel. Still dreaming about it now! 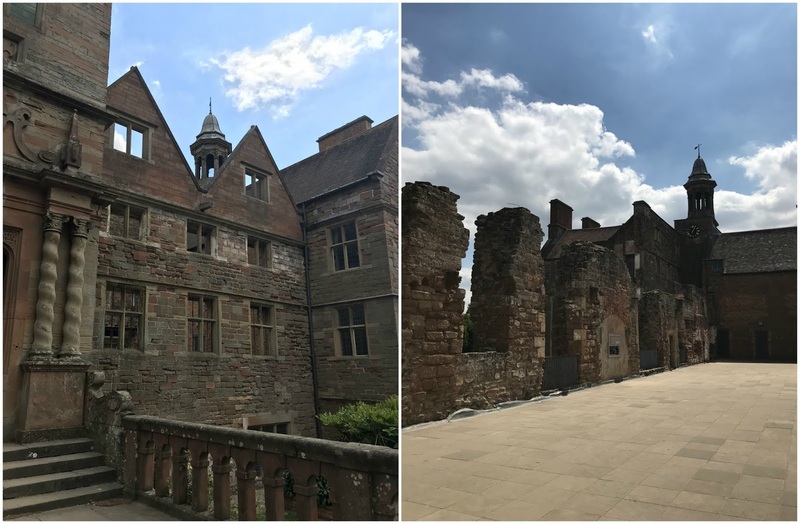 We had a little walk around the gardens, and the grounds first, then did the Abbey ruins, before settling down for our picnic. After lunch we walked through part of the woodlands, and it was lovely to pass families having fun, playing cricket or rounders, hearing them laugh, oh and the sound of the Lion King in the background. The only thing you can't do there is cycle, which in some ways is quite nice because you're not having to dodge bikes all the time. Nick and I cycle and it would be a lovely route around the lake but I get it, just safer for all the young children walking around too. We found a nice little spot for our picnic. Not too far from the car as we didn't want to lug everything further into the park. It's okay when there's a big group of you but we couldn't be bothered as knew we wanted to eat and then go walking again afterwards. You may have seen on my Insta stories that I bought a new gin from an event I went to last week. It's one of the new artisan infusion gins that Burleighs have just launched, I got the Burleighs Mess and it's INSANELY good. Bloody amazing. So drinkable, so dangerous!! 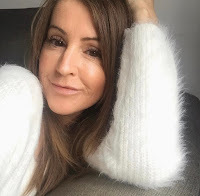 Have a cheeky look here. You will thank me. 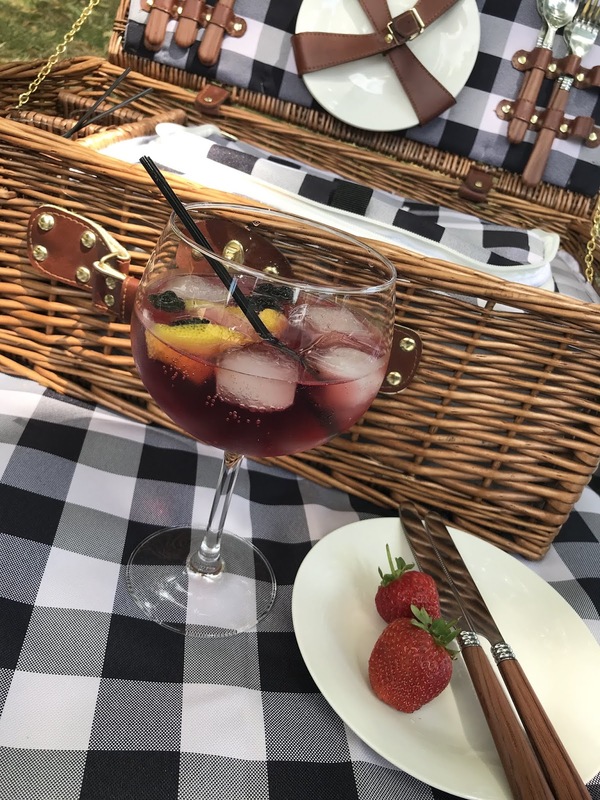 Proper gin glasses, straws, and we even took the fruit (blackberries and lemon zest) to go in it, and plenty of ice stuffed into a drinks container. You know, the ones that you have for your hot or cold drinks when you're on the go and it keeps it at the right temperature. Nicks genius idea! Shoes off, crusty bread with pate and a gin in hand = HEAVEN. It really couldn't have been a more perfect day and without a doubt we'll be going back very soon. 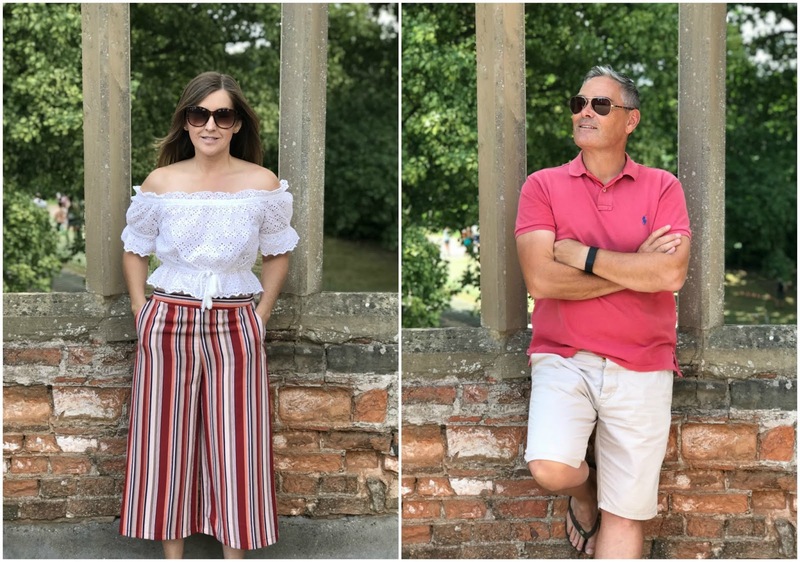 If you fancy having a look at what Rufford Abbey have to offer you'll find it here and I've linked some similar outfit options below. 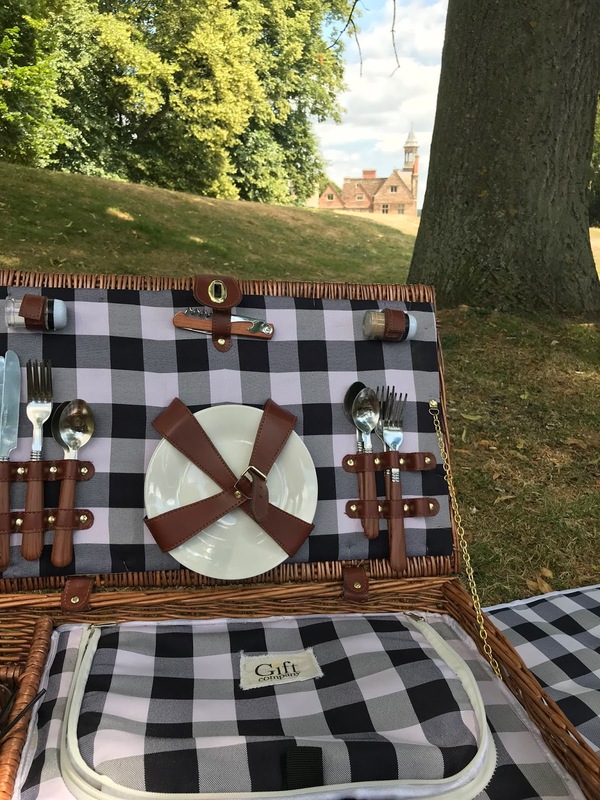 Where's your favourite place for a day out with a picnic?